iOS 11 brings with it a significantly revamped Control Center, and love it or hate it, there's a bit of a 'gotcha' when it comes to Bluetooth and Wi-Fi. Turns out that turning off either one in the Control Center doesn't actually toggle them off. You'll need to go to the Settings to disconnect Bluetooth and Wi-Fi completely. 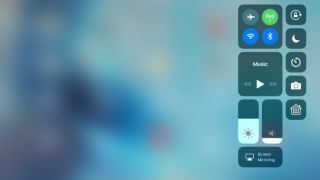 "In iOS 11 and later, when you toggle the Wi-Fi or Bluetooth buttons in Control Center, your device will immediately disconnect from Wi-Fi and Bluetooth accessories. Both Wi-Fi and Bluetooth will continue to be available[.]" This is so features such as AirDrop, AirPlay, Apple Pencil, Apple Watch, Handoff, Instant Hotspot and Location Services continue to work, Apple says. But it also potentially leaves iPhones and iPads vulnerable, especially because users might think they turned off Bluetooth and Wi-Fi when those are actually still running. Turning off Bluetooth and Wi-Fi is generally recommended because it helps save battery life and prevents your device from connecting to suspect networks. If you forget (or simply don't know) that your device is searching for a connection, it could pose problems. Apple's iOS 11 update also has some odd conditions for toggling Bluetooth and Wi-Fi back on if you toggle them off within the Control Center. For example, the radios will fire back up at 5am local time everyday or if you restart your device.